"Dr.Franklin/Robin Smith has a firm grasp on the life of this very pivotally important founding father." 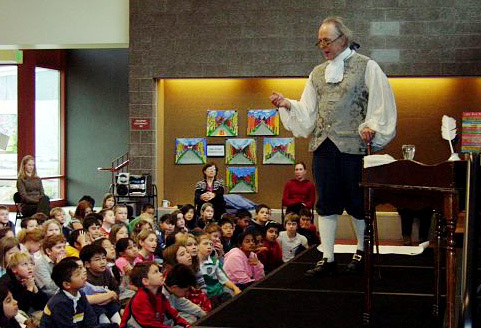 An engaging entertainment experience for your group, social gathering, or school, Benjamin Franklin, The Original American is an opportunity to depart from the ordinary. 'Ben' charms, delights and delivers a theatrical punch through the novelty of the Chautauqua style. Coupled with the wit and repartee of Dr. Franklin himself, the interactive quality of Benjamin Franklin, LIVE! is the perfect way to keep performances and benefits stimulating, guaranteeing fun and enlightenment for all. $1,500 per performance, plus Travel & Lodging. Multiple-performances & Non-Profits may qualify for discounts. We also work with The Interactive History Company, helping your students understand many people and times from throughout History. See for hands-on educational programs based in the Ancient Mediterranean, European Middle Ages, English Renaissance, American Colonial and Civil War. Prices subject to change. Travel fees apply. Please contact us for information on multiple-performance discounts and sponsorships.